Addressing the growing concerns about reading, math, and writing skills of freshman-level students, this volume provides different perspectives and approaches to the assessment of basic academic skills in higher education. 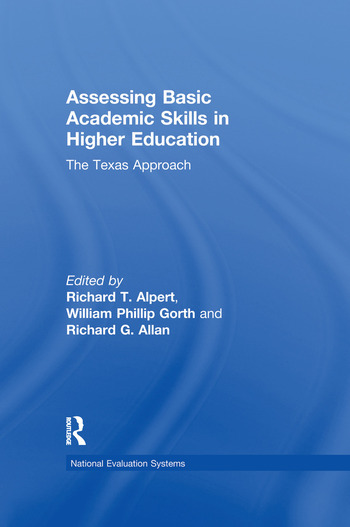 The book provides an in-depth investigation into the Texas Academic Skills Program (TASP). More generally, the book provides insights into the construction of testing programs and their evaluations. The development and implementation of testing programs is discussed by outstanding educators involved and will be of great value to program administrators, policymakers, deans and faculty members of colleges, state legislators, and educational professionals working directly with institutions of higher learning. Contents: Part I:Access to Quality: The Challenge for Higher Education. W. Delco, Testing from a Legislative Perspective. W. Sanford, TASP: An Opportunity to Regain Opportunities Lost. J.M. Matthews, Preventing Test Bias in the Texas Academic Skills Program. J.M. Matthews, R.T. Alpert, Balancing State Initiative and Campus Participation. M.J. Justiz, M.C. Kameen, The Assessment Movement: Improving Quality of Limiting Access for Minority Students? T. Shanahan, New Conceptions. C. Pine, Using Assessment to Improve Instruction: The New Jersey Algebra Project. E. White, Measuring Writing Skills Using the Process Model. T.J. Marchese, The Role of Basic Academic Skills Development in the Reform of Education. A Panel Discussion on the TASP. Part II:Components of the Texas Approach. A Generation of Failure: The Case for Testing and Remediation in Texas Hiqher Education. Legislation. Texas Higher Education Coordinating Board Rules and Regulations. The TASP Program Summary. TASP Skills. Bias Concerns in Test Development. The TASP Test Registration Bulletin. "...designed as a guide for all who are involved in test development....the book offers one approach to problem identification, program implementation, and program evaluation. It is an example of how one system wrestled and continues to wrestle with the increasing concern over basic skills among entering college students."